"For the drover's life has pleasures that the townsfolk never know." Travelling stock routes are recognised in cultures all around the world, however, they seem to hold an extra special place in Australia’s historical culture. Dating back at least 150 years, the original stock routes followed Aboriginal trading routes, or meandered alongside major waterways. Henry Lawson and ‘Banjo’ Patterson both wrote about drovers and the droving life, with Clancy of the Overflow recognised as one of our most iconic poems. Although we don’t see droving as often as we used to, travelling stock routes still play an important role in modern Australia. They allow for the safe movement of stock between locations, provide an alternative food source for stock in times of drought, and their regular use helps to create firebreaks and control growth around water sources and along travel routes. 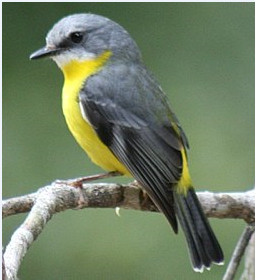 Travelling stock routes also have an environmental impact , offering safe travel routes for endangered species, in particular birds. Although land surrounding a stock route is often cleared for use as farmland, the trees in a stock route are not, and offer sanctuary for many of our native species. 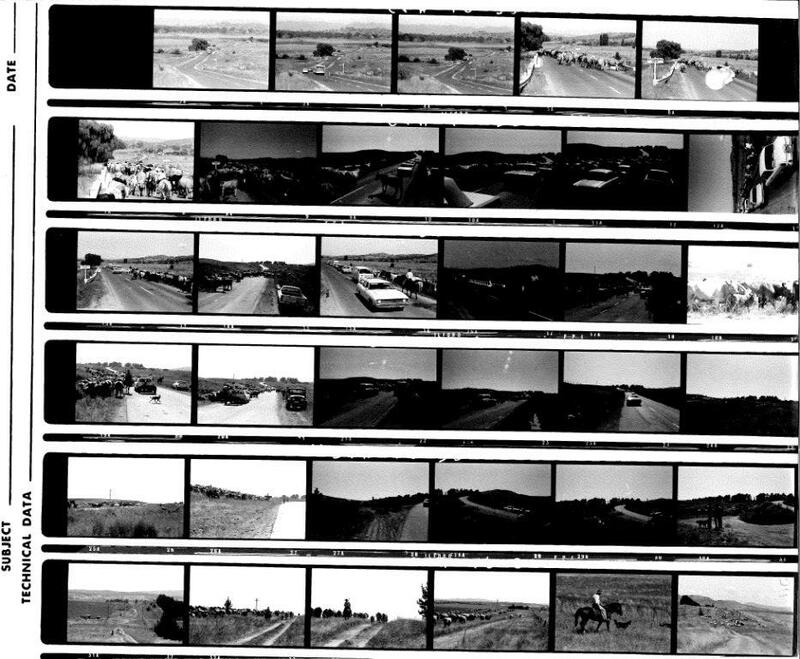 Records relating to the use of the travelling stock routes in the ACT are ArchivesACT’s August Find of the Month. 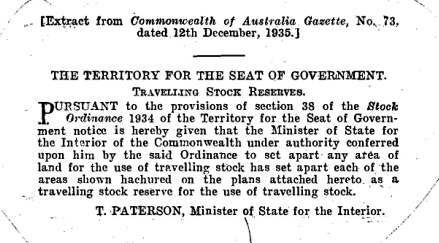 Legislation regarding travelling stock routes was enacted in the Stock Ordinance 1934 (Cth ). This ordinance set out agreed parcels of crown land to be made available for droving. Droving was not always the romantic notion our poems lead us to believe. The life of the drover was lonely, their diets were often poor and they lived exposed to the weather for weeks on end. 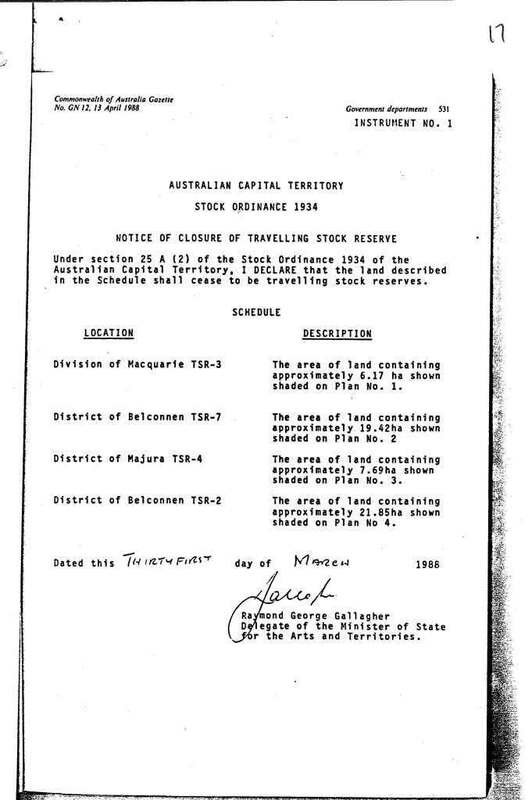 Some of the conditions owners and drovers had to abide by when using stock routes included: paying levies per head of the stock they were droving; not staying for more than one night in any one location; carrying permits; ensuring that these permits were passed on as the stock changed hands; ensuring that the stock had an authorised ‘brand’ or ‘mark’; lodging and following a pre-approved route and time-frame; and providing notice to landowners if the crossing of private land was required. Should any stock expire on the drive, the drover was also responsible for destruction of the carcass, with a hefty fine applying should any evidence be left behind. Although these conditions may seem stringent, they served an important purpose which was the protection and rehabilitation of the route for ongoing use. The legislation also acknowledged some of the difficulties that drovers faced by adding clauses for animal protection and allowing extra time to be taken when transporting young or expectant stock. Recognition was also given to extreme weather conditions or natural disasters, allowing drovers to change routes in case of emergencies such as flooding. In the ACT the original legislation allowed for the use of fourteen parcels of crown land as agreed travelling stock routes. This was reduced in 1987 when the ACT undertook a study into the use and viability of the routes. Some routes were found to be unsustainable due to urban redevelopment and others were simply not being used anymore. Information on travelling stock routes today can now be found in the Stock Act 2005 (ACT). 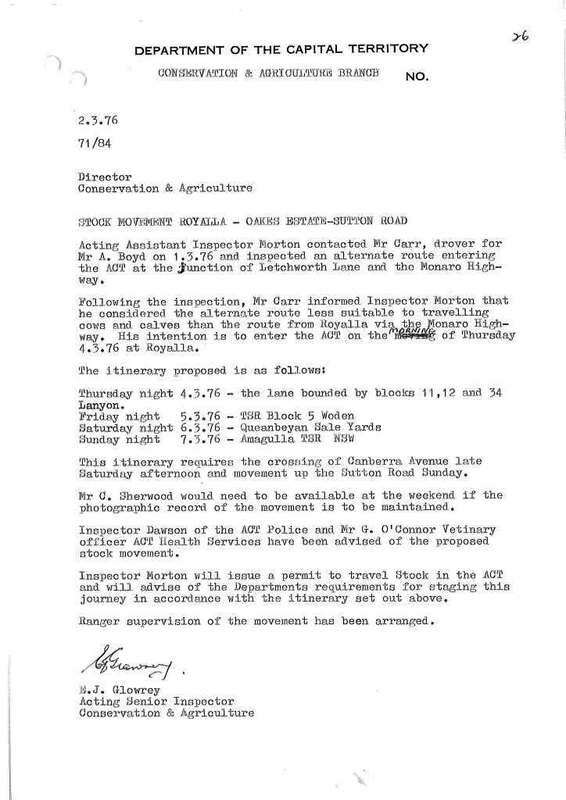 In 1976 a specific stock drive between Royalla and Oaks Estate, Sutton Road, raised some administrative concerns. 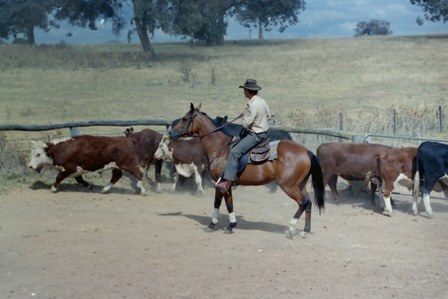 Often drovers held NSW permits and crossed briefly into Territory land but did not hold any ACT permits, thinking that the one permit was enough. This made access more difficult as support from local authorities, police, veterinary officers and rangers, was often required for crossing major roads. It also identified some ACT and NSW border issues as stock routes were not directly matching up. This particular drove was beset with issues. Young calves were born and with their soft hooves they were unable to keep up the pace, so extra time was required for their welfare. A change in route was also required because they were unable to cross the more ‘scrubby’ standard route. Notice was not given to ACT authorities in the usual time frames, and as the drove required crossing major thoroughfares, including the Hume Highway and Canberra Avenue, the local police and rangers had little time to plan. On nearing the NSW border, it became clear that there would be issues with moving stock through land that was not designated for travelling stock routes, with the railway line providing an added element of difficulty. Working with the NSW authorities, a plan was put in place to gain permission to move the stock across the line at a designated place and time. The ranger responsible for reporting on this particular stock drive took some photos of the stock crossing the Hume Highway. He reported that while the stock did need to cross the highway, the process ‘only stopped the traffic for a couple of minutes’. He recommended that a sign ‘would be sufficient to warn motorists’ of the potential risk. It is hard to imagine this applying to the Hume Highway we know and use today. Despite the short notice and the intricacies of the drive, the stock arrived rested and there was minimal disruption to the community. The planning and communication of the public servants involved was recognised as key to this successful outcome, and the case was used to evaluate the current system. But I doubt he’d suit the office, Clancy, of ‘The Overflow’. 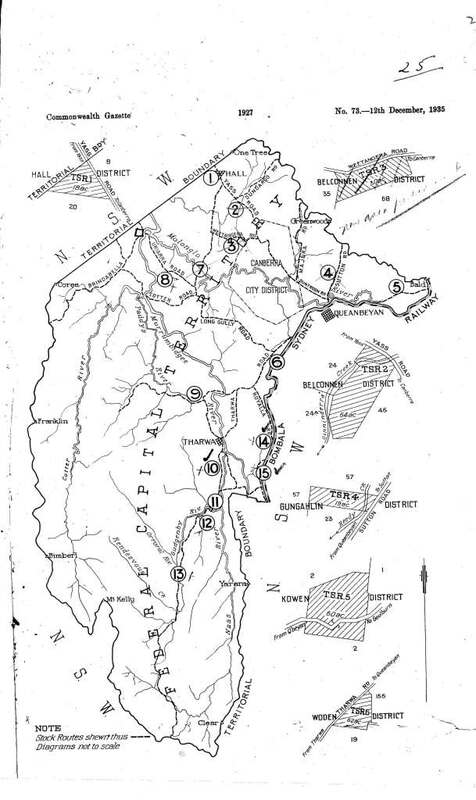 ArchivesACT hopes you have enjoyed this look at the travelling stock routes of the ACT. If you have any photos or stories relating to these routes we would love you to share them with us. Why not tweet about it and don’t forget to include @ArchivesACT. 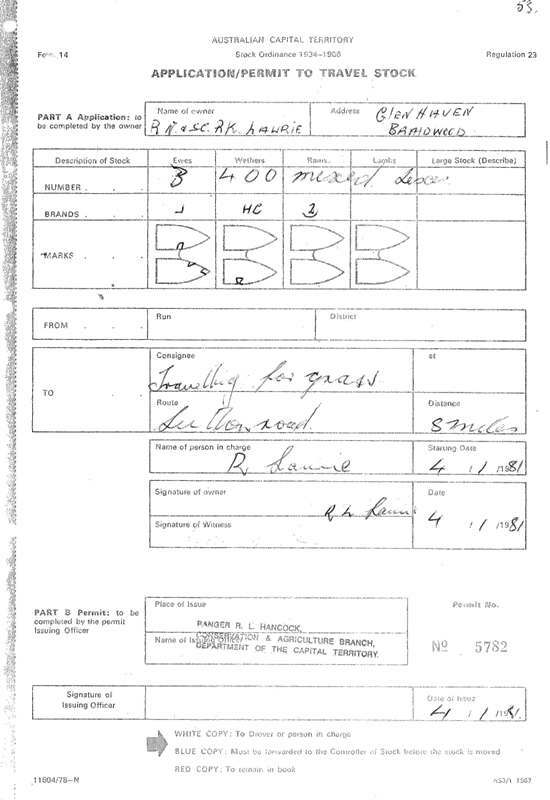 If you are interested in finding out more about the travelling stock routes, or you would like a copy of any of these records please contact ArchivesACT through our “Request a Record” service. To view the original documents you can also contact us to arrange a suitable time to visit the Archives ACT Reading Room located on the top floor of the Woden Library. 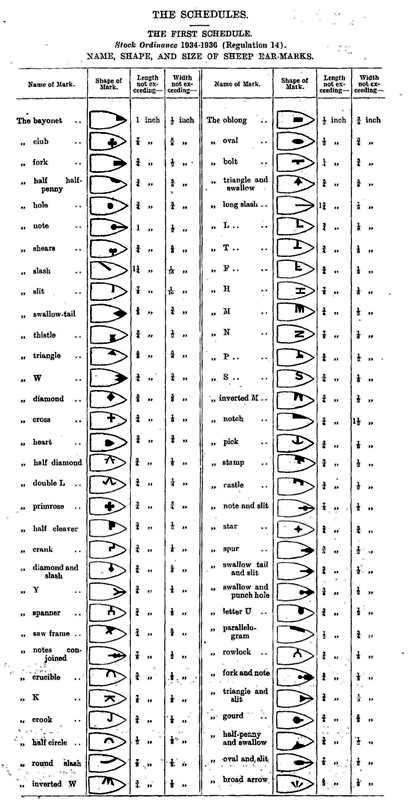 If you do not already have compatible software on your computer, free file readers/viewers can be downloaded from the following links.